We was going south from Kiel in Germany (coming from Oslo, Norway with the car ferry MS "Color Fantasy"). On the way south we normally go through Hamburg which can be time consuming on a Saturday in July. We then decided to take a swing and go southeast of Hamburg. As the roads over 2 -3 hrs. become smaller and smaller we understood we had done some navigation mistakes but had to head on anyway. 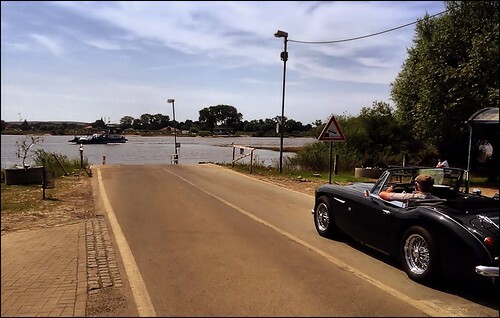 In the end we arrived at a tiny ferry crossing over the river Elben at a place which also was the former border between West and East Germany. We was by a small village by the name Schnackenburg. It was for sure an idyllic place and not least surprising to explore on a summer afternoon. In the end we arrived at our planned destination surely 1-2 hrs. after schedule. Looking at the net I was surprised to see that there are still many such small river crossing existing in Germany along their big rivers. All photos/videoes is copyrightprotected by owner J. R. Johanson. Blog:. Simple theme. Powered by Blogger.